It's time for another really fun project using Andy Skinner products from Andy's Online Store, Tando Creative, and DecoArt. I call this useful project the "Industrial Wings Compartment Book". Not only is it an interesting decorative piece of home decor but it has a secret compartment to hide your treasures. 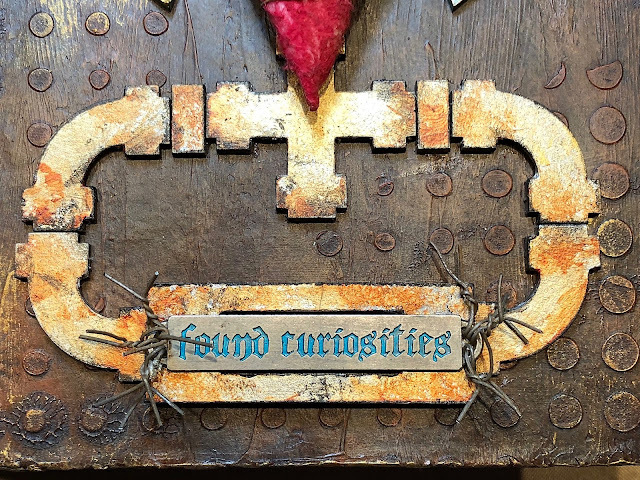 It has a very grungy, rusty look that was created through the magic of Andy's rusting techniques and DecoArt's amazing Media Line of products. 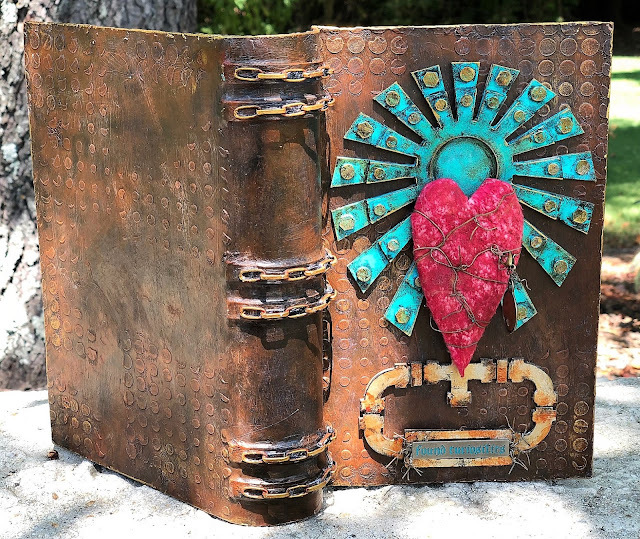 Believe it or not, this began as a plain paper mache book measuring 9" x 6 3/4". In this photo, you can see the basic book and my layout of the Tando Creative Greyboard pieces to create the intricate design for the cover. These Tando pieces were a combination of Andy's El Daro set which includes the Industrial Wings Kit and Tando Creative Drainpipes. 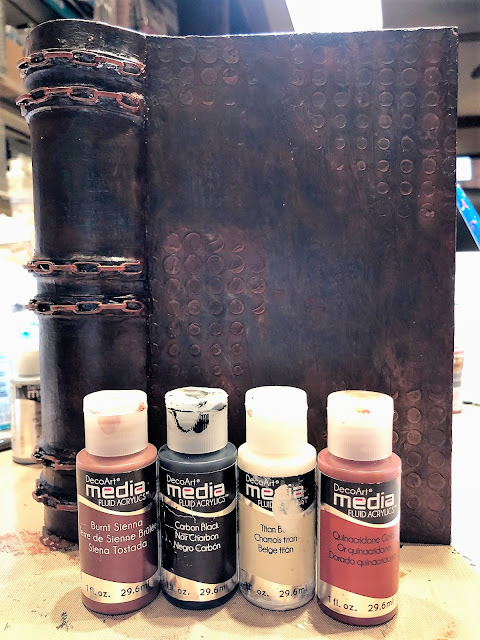 The transformation begins by complete covering the book with DecoArt Media White Gesso. I added the link chains to the spine usine Fabric Tac glue and let them dry. 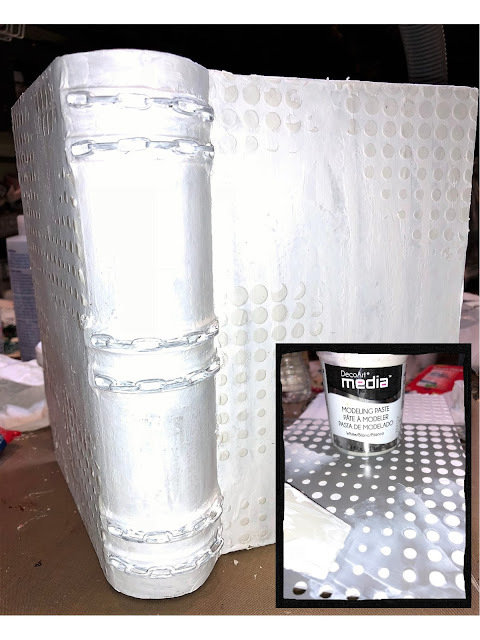 Then I added more Gesso to the chains to blend them into the book background. Next lay Andy's Halftone Stencil randomly on both sides of the cover. 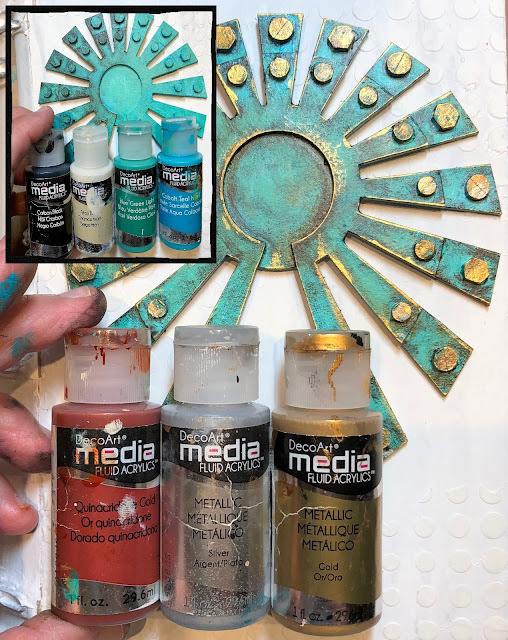 Use a palette knife or some sort of straight edge and scrape DecoArt Media Modeling Paste over the stencil. 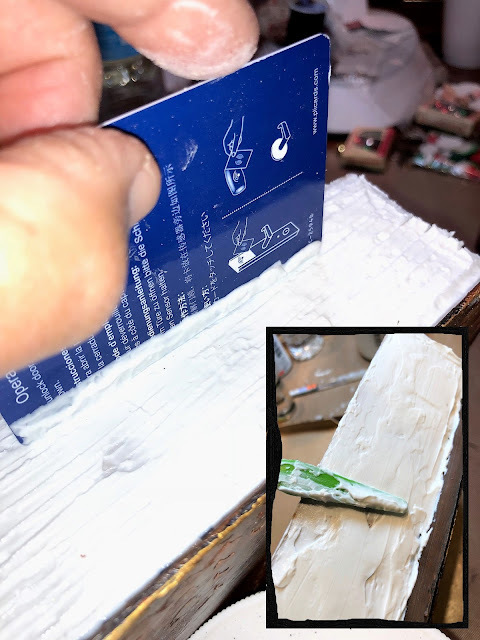 Wash the stencil and straight edge immediately after using. Let air dry or heat set. While the book cover is drying, begin to create the lovely Industrial Wings using DecoArt Media products. The inset picture is the first stage of the transformation. 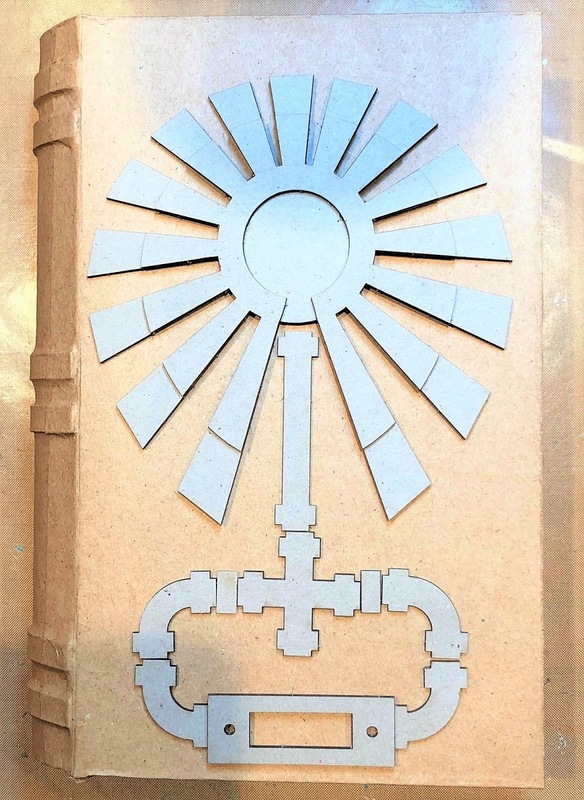 Begin by gluing all of the greyboard pieces together. Then paint a base coat of white so that the patina colors will be truer. I began with a coat of Cobalt Teal Hue mixed with Titan Buff. 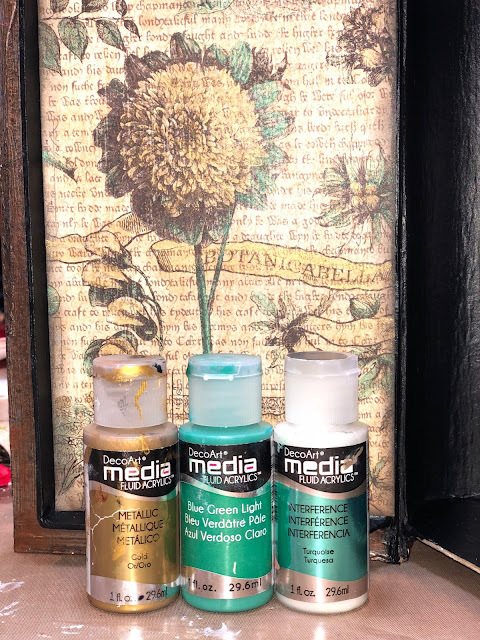 Next dry brush a layer of Blue Green Light. Once that is done, use a small brush to add Carbon Black to the outside edges of the piece as well as sharing areas on the wings (particularly around the bolts and randomly on the flat portions of the wings). Finally, add small random touches of Silver and Gold Metallic on the bolts and along the edges of the wings. I also added little random touches of Quinacridone Gold on the wings to give a bit of a rusty appeal. Set to the side to glue onto the cover once it is finished. Now it's time for the magic to happen to the cover of the book! Completelyl paint the cover of the book with DecoArt Media Fluid Acrylics Carbon Black. Let it dry or heat set it. Then begin dry brushing the entire cover first wtih Burnt Sienna. This is a slow process but so worth the end result! Continue to dry brush the Burnt Sienna until you achieve a rusty look. Then dry brush Titan Buff randomly on the raised areas to better accentuate them. Dry brush over the Titan Buff again with the Burnt Sienna. Dry brush some Quinacridone Gold randomly on the book cover, particularly on the raised areas. Finally, randomly dry brush some Carbon Black on the edges and the crevasses of the book for an aging effect. Also do this technique to the chains that are glued onto the spine. They will really pop with the Quinacridone Gold. Paint all of the pipeline pieces using Metallic Silver followed by Metallic Gold. 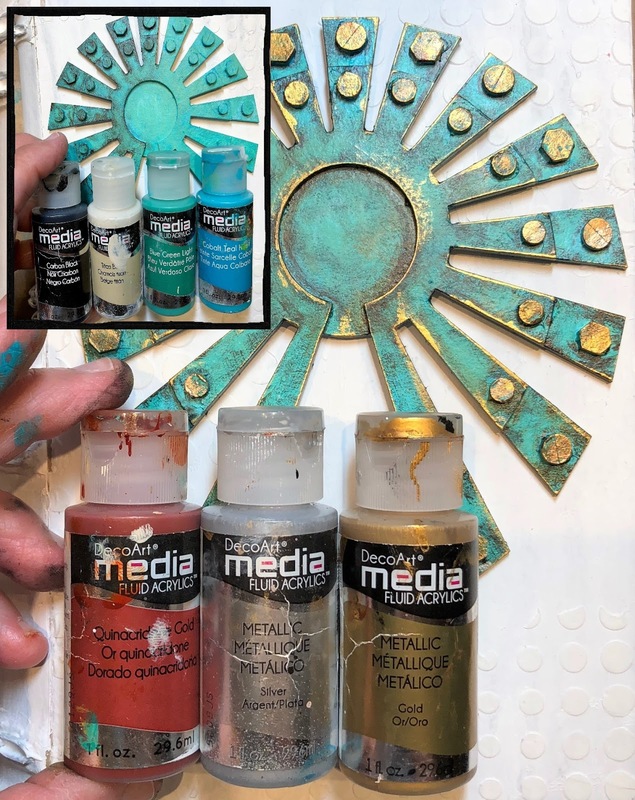 Add some Quinacridone Gold in random areas to create a rust effect. Finally, add touches of Carbon Black on the edges. In this photo, you can see the pipeline pieces as well as a word strip added to them. The word strip is attached using Andy Skinner's new Rusty Wire in 22 gauge. I love how it looks so rustic and grungy. I also wire wrapped the heart that comes with Andy's Industrial Wings kit and glued it in the center of the wings. 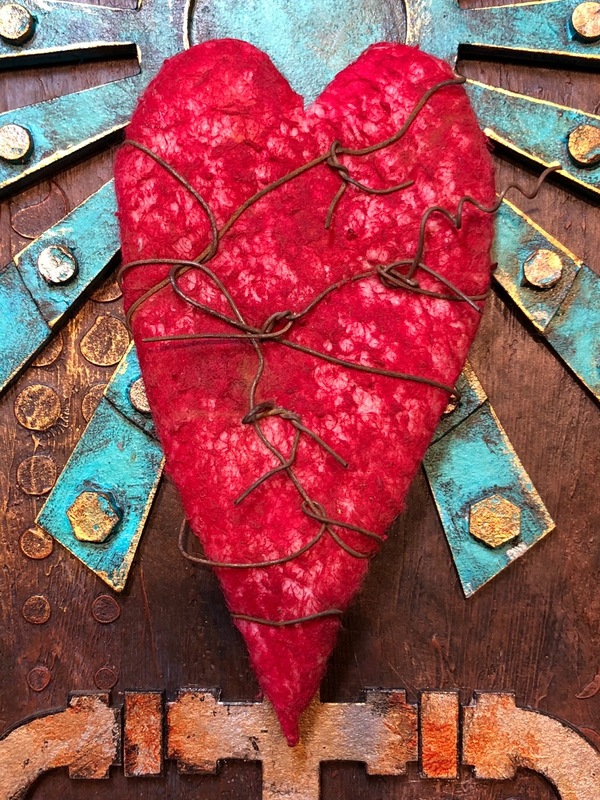 I glued some padding to the heart and then covered it with some quilt batting. Next I added DecoArt's Fluid Acrylics Primary Magenta to colorize it. I LOVE the wrapped wire! 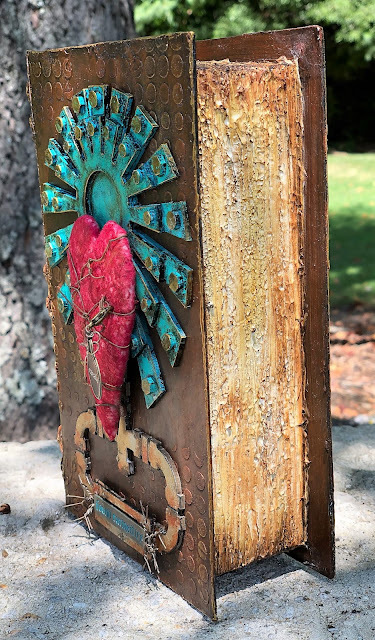 To convincingly make the paper mache book look like an old book, I added the "pages" to the outside. This was done by applying a fair amount of DecoArt Modeling Paste to what would be the exposed pages of the book. Then I used a hotel key (any straight edge would work) and did a chopping motion across the entire area. This creates a worn page edge appearance. Let this completely dry. To colorize the pages, begin with a layer of Titan Buff. Then dry brush Burnt Umber over the raised areas of the book pages and along the corners and inside edges. 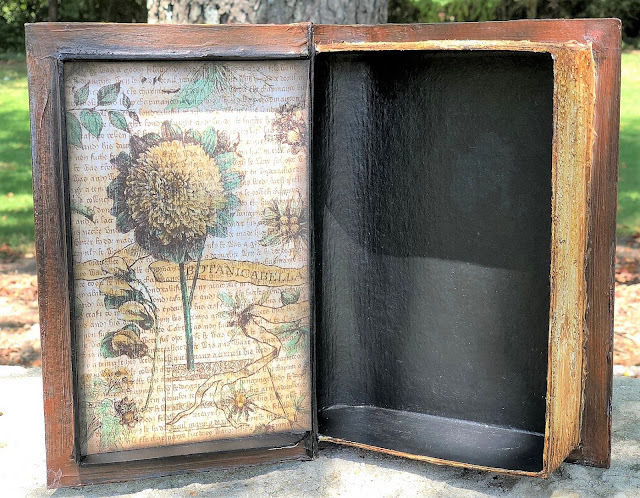 Next dry brush Transparent Yellow Iron Oxide to give that old, yellowed look to the pages. Finally, lightly dry brush some Carbon Black to some of the raised areas, particularly on the corners of the pages and where there would typically be lots of wear on book pages. Here is a photo of the finished "pages". Very realistic. 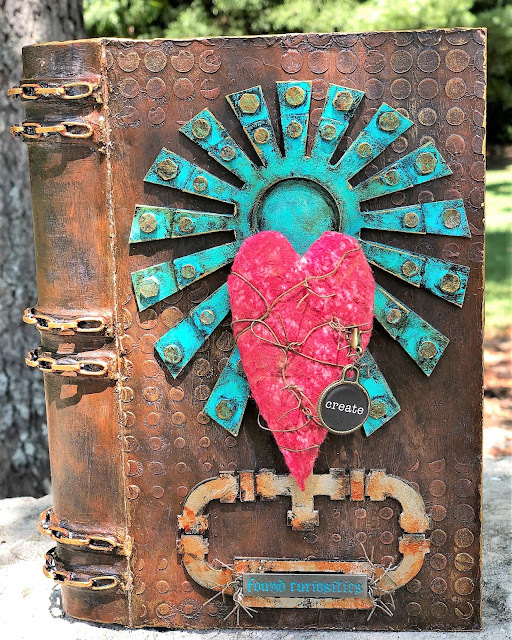 The inside of the book was painted with DecoArt Media Fluid Acrylics Carbon Black. I added a piece of Printed Cardstock to the interior and highlighted it using DecoArt Media Fluid Acrylics colors Metallic GOld, Blue Green Light and Interference Turquoise to accentuate the design of the paper. The paints were mixed with water to give them more of a transparent quality on the paper. Here is a photo of the interior of the book. It's a great secret compartment! And here is a look at the outside cover of the book. I love how rusty and aged it looks! Here is a list of all of the supplies used on this project. Fun and easy to do! So many brilliant ideas and techniques... like Tracy, I particularly like those page edges - very cool!